Ultra-Low Current Magnets - Cryomagnetics, inc.
Suzaku launches with a Cryomagnetics’ superconducting magnet inside! 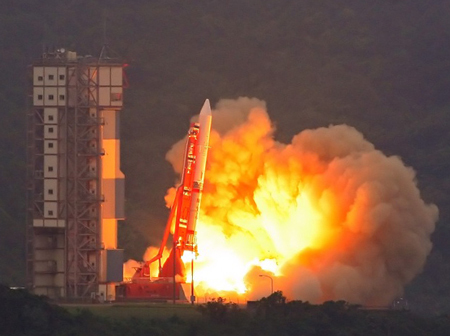 On July 10, 2005, the Suzaku (formerly Astro-E2) spacecraft successfully launched from the Uchinoura Space Center in Japan. Suzaku is a collaborative project between the Japan Aerospace Exploration Agency (ISAS/JAXA), and NASA Goddard Space Flight Center. Suzaku is an astronomy spacecraft used to monitor X-rays emitted by stars, galaxies, and black holes. To complete its mission, Suzaku uses several X-ray detectors, including one called the XRS. In order for the XRS to operate correctly, its microcalorimeter must be kept at temperature of 60 millikelvin. An adiabatic demagnetization refrigerator (ADR) with a Cryomagnetics’ superconducting magnet installed is used to achieve the ultralow temperature required by XRS. This is believed to be the first superconducting magnet application in space. Designing and manufacturing a superconducting magnet for this task was demanding. The superconducting magnet needed to be very lightweight yet withstand the stresses of launch. Operating current must be very low (2 amperes), but generate a high magnetic field (2 Tesla). Stray magnetic field must be contained largely within the superconducting magnet itself so the sensitive instruments surrounding it are not affected. The original project (Astro-E) was completed in 1999, but the launch vehicle malfunctioned. The original satellite with a Cryomagnetics’ superconducting magnet was destroyed. The Astro-E2, renamed Suzaku, is the replacement system. For more information about Cryomagnetics and our products, please contact Brian Pollard (865) 482-9551, bpollard@cryomagnetics.com.